Have you ever wanted to don the finest in jewelry and beauty products for a big night out on the town? Click here to play! This game allows you to do just that, and if you're successful, you'll be able to realize your dreams of glamour with your endless cash winnings. To become a beautiful butterfly, you'll need to spin the beautiful butterfly. This golden pendant acts as a wild symbol and will replace most other symbols to help you create more winning combinations. As is the case with all glamorous ladies, you'll have plenty of other items in your arsenal to help make you look fabulous. Spin three to five martinis and you could take home up to 600 credits. Three to five bottles of the finest perfumes will get you up to 300 credits. Also look out for golden necklaces, rings, expensive sunglasses, shoes, purses and makeup to help you in your quest for beauty. Blondes have more fun, which is certainly true in this game. 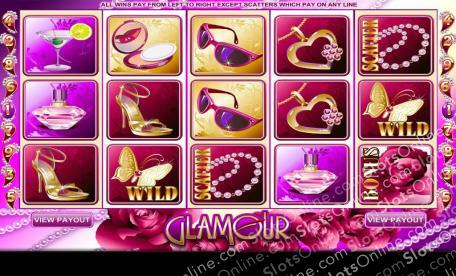 The blonde beauty acts as a scatter, and she will trigger up to seven free spins. Spin the fragrant red rose and you could trigger a bonus feature in which you will play for bonus cash prizes. Doll up for a night on the town in this glamorous game and see yourself returning from a night of fun with a designer bag full of cash! The blonde beauty acts as a scatter symbol. Spin three or more anywhere on the board and you will be rewarded with up to seven free spins. The golden butterfuly pendant acts as a wild symbol. This jewel will replace all other symbols excluding scatters and bonuses. This will help you create more winning combinations. The red rose symbol triggers the bonus game. Spin three or more of these anywhere on the board and you'll get a chance to shoot cupid's arrow through hearts for a chance at bonus cash.